Hi Kayelle! As always, it's wonderful to be here today!! 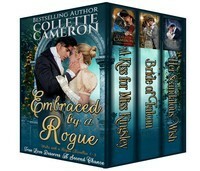 Loved every single novella in this boxed set, Collette! Thank you, Janice. The next Waltz with a Rogue Novella has a Wimpleton ball scene too! Beautiful cover! Congrats on the release! Thank you so much, Alanna. I love the cover! Congratulations on the release, Collette. I'm in awe of the speed at which you can write! You go! Well, this set is a compilation of three novella's so I didn't have to write anything new. Oh, Congratulations! Sounds like a great collection!! !